Bali is an incredible destination for all kinds of travelers. Whether you’re a solo female traveler backpacking your way around Southeast Asia or you’re looking to unwind at yoga and surf retreats, there’s something for everyone. But if it’s your first time traveling to the island paradise, there are a few things you need to know to help your trip go smoothly. 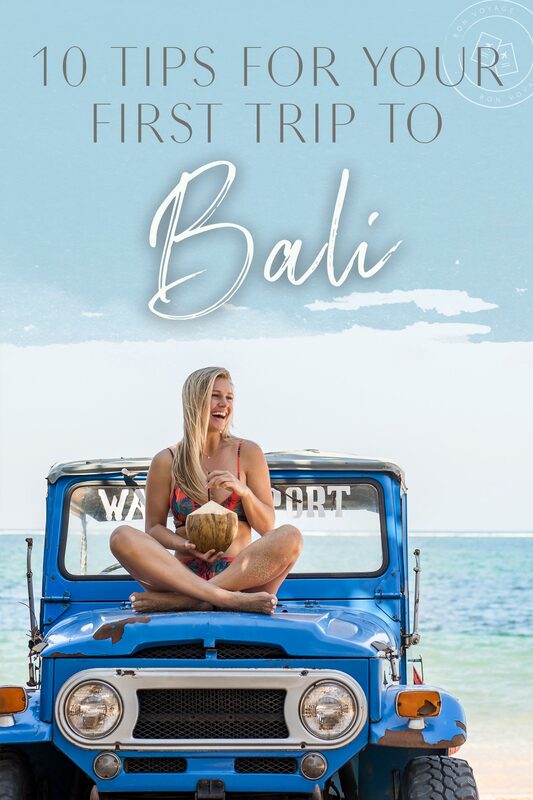 Here are 10 tips for your first trip to Bali in Indonesia! Renting a motorbike is the “way” of Bali and very cheap—and it saves time in traffic. If you don’t feel comfortable driving yourself, you can use the GO-JEK app for an Uber-like service but on the back of a motorbike. Taxis are the most expensive (but still cheap), and Uber is somewhat banned by the taxi monopoly. You can still use Uber, but you need to be very discreet about it and can’t use them to get to and from populated areas. Otherwise, I recommend using the Blue Bird app for hailing rides. Cash is king in Bali. Always carry a handful of 10,000 to 100,000 notes (valued from $0.75 to USD 7.50) for daily expenses and haggling. It’s only the more Western, upmarket restaurants and shops that will accept payment with credit card. If you’re shopping at the markets or eating at the local warungs, you’ll need to pay with cash. While there are plenty of ATMs around Bali, always check to see if the bank you’re withdrawing from accepts foreign bank cards. 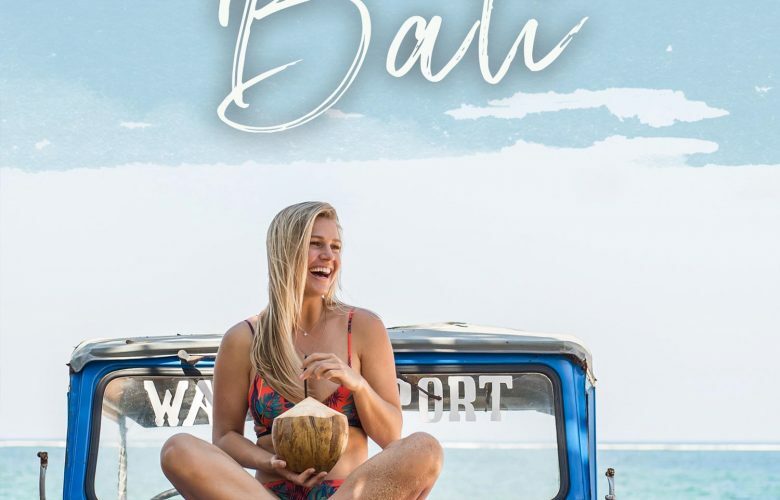 Bali is more than Seminyak and Ubud. Get off the beaten track and venture to the north of the island. You’ll find fewer crowds, remote temples and plenty of beautiful waterfalls to explore! Some of the lesser visited spots around Bali include the Jatiluwih rice terraces, Aling Aling waterfall, and the Suluban Beach Cave. 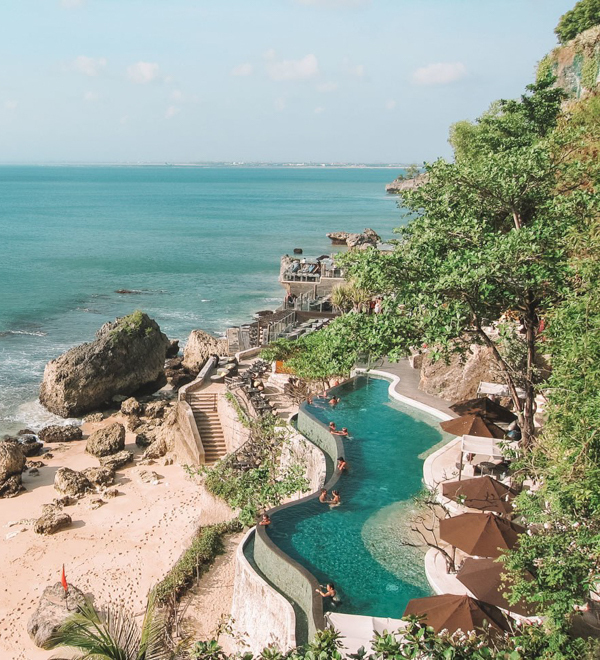 While Bali is an easy destination to explore on a shoestring, you still need to keep an eye on your budget. It’s easy to spend way more than you intended to at the restaurants that cater to tourists and the beach clubs. 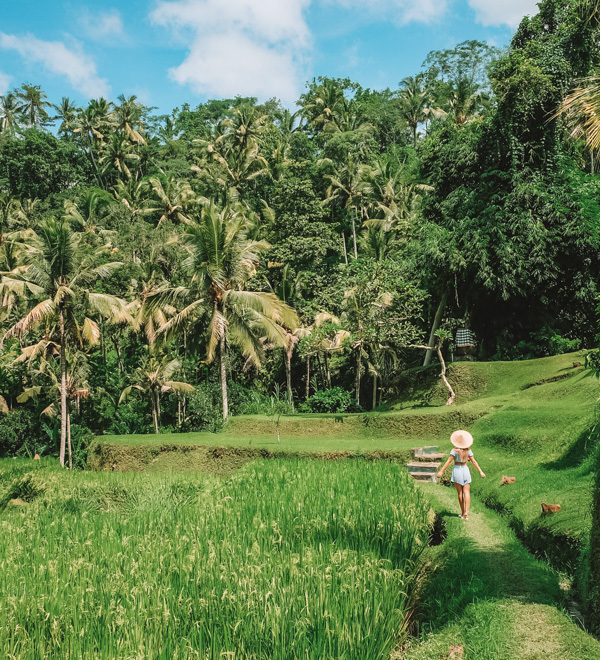 Smack-dab in the jungle, Ubud is known for its forest home to hundreds of monkeys, but be careful! Some of the monkeys can be super aggressive towards tourists – especially if you make eye contact and don’t have any food. I’ve found that the friendliest monkeys are at the entrance of the forest. For the best photos, walk further into the forest until you get to a beautiful temple area. If you’re traveling to Bali as a solo female traveler, there are tons of great hostel options! It’s an excellent choice if you’re looking to link up with other travelers and you can always opt for a private room if dorm rooms aren’t your thing. For affordable private villas in Bali, I recommend using sites like Airbnb. I’ve managed to rent an entire villa for as little as 350,000 IDR ($25 USD) a night! Nusa Penida is a relatively underdeveloped island located south-east of Bali. While it lacks the trendy restaurants and beach clubs, you will find incredible natural beauty! While you can take a tour, you can DIY a day trip over there by using Rome2Rio to find the best way to get between Bali and Nusa Penida for your budget. The Gili Islands are another excellent option if you’re looking to spend longer than a day away. My personal favorite is Gili Trawangan! 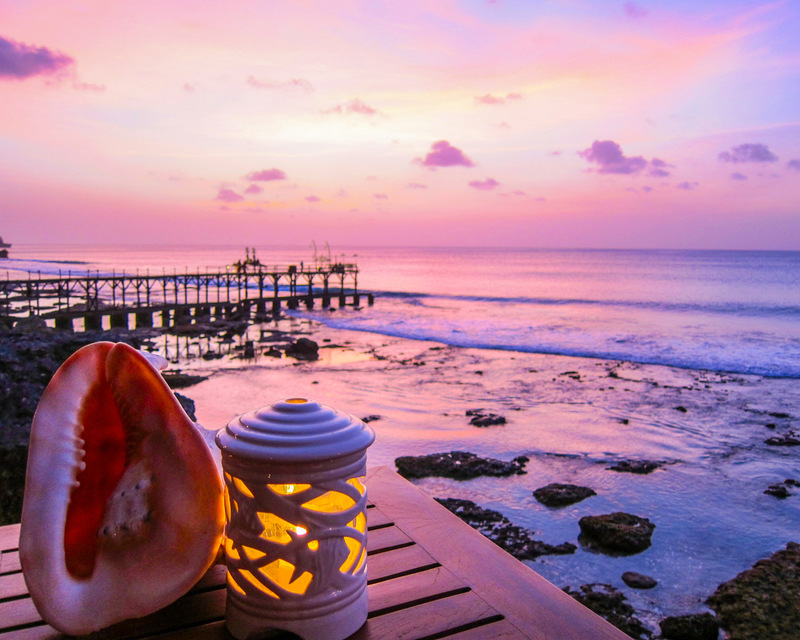 It’s the perfect destination for scuba divers or travelers looking to experience Gili’s legendary nightlife! Bali’s cuisine alone makes it worth the visit. Mouthwatering traditional dishes like nasi goreng (fried rice), mie goreng (noodles), satays, martabak pancakes, and noodle soups are a must-try for traveling foodies. The best place to get authentic Balinese food is at the local restaurants which are called warungs. For as little as $2 USD you can get a plate of chicken, rice, and veggies! But leave room in your budget to eat at Bali’s more Western establishments. The island is full of beautiful little cafes that serve up delicious and healthy food! One of my favorite things about Bali are the affordable spa services. You can get a one-hour aromatherapy massage for as little as 80,000 IDR ($6 USD)! With such a low price point, it’s easy to budget for a massage every single day! If you ever feel like splurging, try a spa at one of the many luxury hotels. For tours around the island, hire a local driver and split the cost with your friends or other travelers to save money. You can hire a driver for less than 300,000 IDR ($23 USD) for the day and visit sites like Mt. Batur and the Pura Gunung Kawi Temple. You’ll be in charge of the itinerary so you can decide how long you want to stay at each attraction! Bali is an easy and safe destination to travel around. Whether you’re going for a week or a month, there’s more than enough to see and do to keep you busy! Do you have tips for first-time travelers going to Bali? Let me know in the comments below!